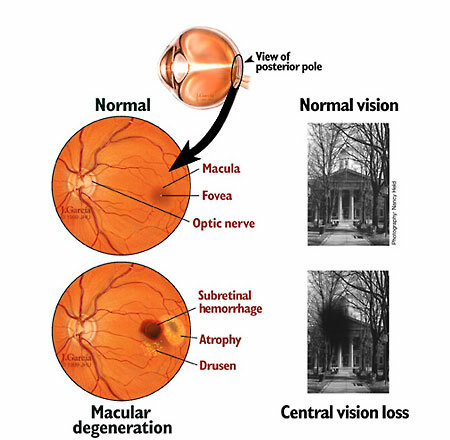 Macular degeneration (MD) is the progressive deterioration of the macula, the light-sensitive cells of the central retina, at the back of the eye. The retina is the sensitive membrane (soft layer) of the eye that receives the image formed by the lens and is connected with the brain by the optic nerve. As these macular cells malfunction and die, central vision becomes gray, hazy, or distorted, and eventually is lost. Peripheral (away from the center) vision is unaffected. Millions of people suffer from MD and it accounts for about 12% of all blindness in the United States. 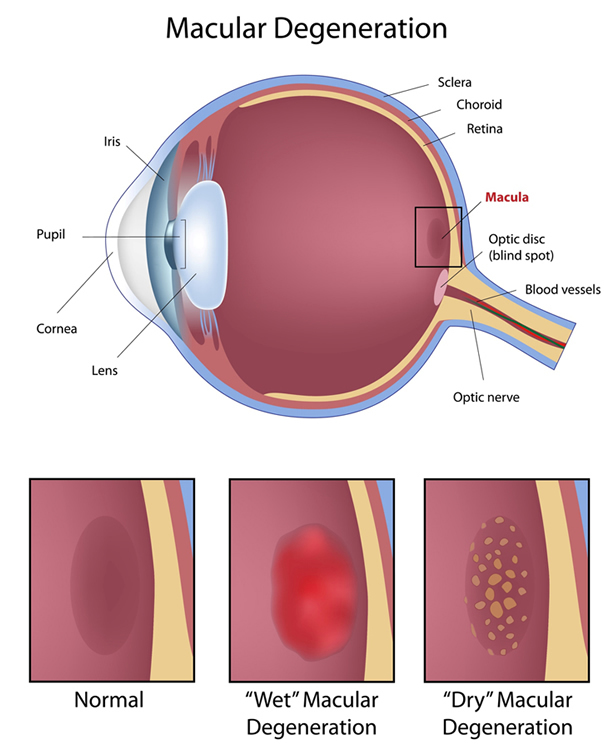 The macula contains the highest concentration of photosensitive cells in the retina. These cells transform light into electrical signals that are sent to the brain for processing into vision. Fine detail vision and critical color vision are located in the macula. The macula depend on nutrient diffusion from the choroid layer, a region of several delicate vascular (pertaining to blood vessels) membranes or structures behind the retina and under the macula. Anything that interferes with this nutrient supply can lead to MD. Age-related macular degeneration (AMD or ARMD) is by far the most common type of MD. One in six Americans develops AMD between the ages of 55 and 64 and one in three Americans over 75 has AMD. About 10% of those with AMD eventually suffer severe vision loss. The incidence of AMD is expected to triple by 2025, as the population ages. Whites and Asians are more susceptible than blacks. Women and those with lighter-colored eyes are somewhat more susceptible. AMD may occur in only one eye. However there is a very high likelihood that the other eye will be affected eventually. About 90% of AMD is the dry form. Over time, the macula thins and the pigmented retinal epithelium, a dark-colored cell layer that supports the retina, is gradually lost. About 10% of dry AMD cases progress to the wet form. In a process called choroidal neovascularization (CNV), new blood vessels proliferate in the choroid and may invade the retina. These fragile vessels can leak blood and fluid into the retina, damaging or killing macular cells and resulting in scar tissue that interferes with vision. If untreated, the macula may be destroyed. Wet AMD progresses more rapidly than dry AMD and severe vision loss typically occurs within two years. Age-related macular degeneration (AMD) appears to result from a combination of hereditary, environmental, and metabolic factors. Over time, highly reactive free-oxygen radicals damage and destroy macular cells. The body’s antioxidant systems that destroy free radicals become less effective with aging. The cause of choroidal neovascularization (CNV) in wet AMD is unknown. However many people with AMD also have cataracts and cataract surgery increases the risk of dry AMD progressing to wet AMD. An Amsler grid, a checkerboard pattern with a black dot at the center. While staring at the dot with one eye, MD causes the straight lines to appear wavy or disappear or some areas to appear blank. A dilated eye exam whereby drops are used to dilate the pupils and a special magnifier called an ophthalmoscope shines a very bright light on the back of the lens to examine the retina. Gross macular changes, including scarring, thinning, or atrophy, may indicate MD. Numerous mid-sized yellow bumps called drusen, or one or more large drusen, can indicate intermediate stage AMD. However, most people over age 42 have drusen in one or both eyes. Fluorescein or eye angiography, or retinal photography. An indicator dye is injected and photographs are taken to detect dye leakage from retinal blood vessels. Indocyanine green angiography examines choroid blood vessels that cannot be seen with fluorescein. Optical coherence tomography. Light waves are used to obtain cross-sectional views of eye tissue. This is easier and quicker than fluorescein angiography. An electroretinogram, whereby a weak or missing electrical signal from an illuminated point in the macula indicates MD. In a family history of MD suggesting hereditary juvenile macular degeneration (JMD), molecular genetic screening can reveal the presence of JMD-causing genes, facilitating early detection. Those with dry AMD should have a complete dilated eye examination at least once a year and use an Amsler grid daily to check for signs of wet AMD. Foods containing omega-3 fats, such as nuts and fish, lower the risk of progression to advanced MD. Many multi-vitamins also contain lutein.